Is your superhero campaign getting a little staid – a little routine – maybe boring. 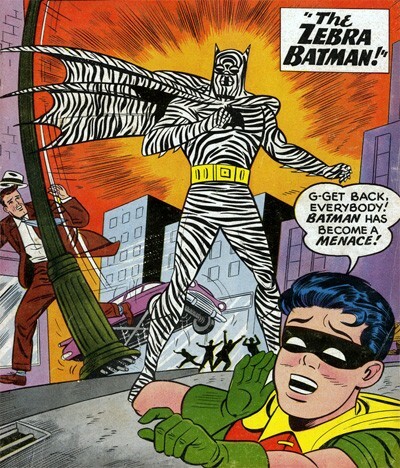 Would you consider bringing the insanity of DC’s Silver Age into it? 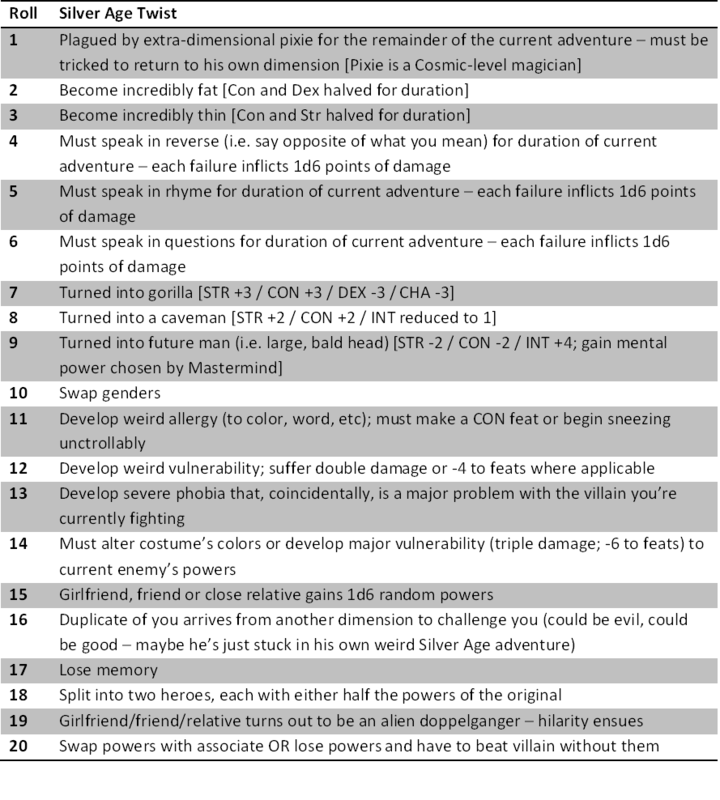 Can your players handle the challenge, or are they a bunch of mopey, modern age cry babies who think getting turned into a gorilla is some kind of punishment? If you answered yes and/or no to the questions in the appropriate order … oh Hell – here’s a chart. Roll a dice. I think my next MM! Google + campaign will draw heavily on the imaginary stories from DC’s Silver Age, though I have no idea how as yet. Edited to correct an error. This is the most awesome chart I've ever seen! I've been wanting to run a Marvel style soap opera campaign but lately I've been leaning more towards a lighter DC 60's style good-guy/bad-guy thing. This would just be icing on the cake! Marvel is very loaded with character-driven stuff – Spidey's angst, etc. – that might be hard to pull off with a group. Works great in a comic book, but not necessarily at the game table. The lighter DC stuff might be easier to run with a group of people – i.e. “You're good, they're evil, get to it.” in an RPG environment. I mostly like it because I'm a goofball. Oh man, my intro to comics was a big grocery bag of Superman titles. You know, all the Superdickery ones. In the expertise I gained from reading all those I highly commend you for this chart! I absolutely, positively adore your list. I ran a Champions game for several years that incorporated much of the above just as part and parcel of the campaign. It was a setting that threw in every comic-ism from the '50s-'70s: martial arts, giant monsters, “after the Comics Code got relaxed” monsters, super-pets, teen sidekicks, power-draining (and -adding) meteorites, etc. Man. I REALLY want to get a spandex-y campaign going soon. I like how “swap genders” and “change gender” get separate entries. Makes me wonder who you might swap with and how many genders are in play. What about “everyone thinks you're a villain and/or the villain is a hero”, and “someone in the team falls in love with a villain (but is probably being hypnotised or something)”? On the genders thing – oops. Guess I'll need to make a correction. I love the craziness that is the Silver Age and that is why all my recent supers games have been set there.